Are You In The Presence of Angels? Angels are beings of light and love who serve as Divine messengers, and who offer guidance, protection, healing, and comfort according to Divine will. If you do… You’re not alone. In a poll completed by the associated press, it was found that 8 out of 10 people believe in angels. In other words most people believe in angels. But how do you know when they are actually near? How can you tell whether you are actually in the presence of angels and not just imagining them? How do you know the signs you are seeing are truly angels? Here are 4 Signs You’re in the Presence of Angels. Seeing angels is actually more common than you might think. But the way angels appear visually is often different than many people would expect. Rather than appearing in a physical form before you, when you’re in the presence of angels you may simply see a flash of light or a sparkle in the air which you see through your peripheral vision, but then when you turn to look it’s gone. You may also notice the presence of your angels visually as a glowing orb of light which you see externally as a quick flash, or internally in your minds eye. You may see an angel appear in your minds eye like a photograph, or a mental movie that just pops into your awareness. From time to time you may even get a mental image of an angel standing next to or hovering over someone you meet, or wrapping their wings around you or someone you love. Feeling that you’re in the presence of an angel, is one of the most common signs that you actually are. You may feel your angels presence as a warm and comforting as your angels make their presence know to you. You may sense a change in the air pressure as your angels enter the room, experience the sensation as a sweet warm breeze, or feel like they’re hugging you, and your energy is immediately uplifted as you come into contact with the light, high vibrational energy of your angels. A slight variation of feeling your angels presence is simply knowing they’re with you… You may not know how or why you know… You just do. If this is happening to you, trust it, and know your angels are with you. Angels are Divine messengers, and so if you’re receiving Divine guidance, this is a clear and powerful sign that you’re in the presence of your angels. One common way to receive guidance from the angels is to hear it. Many people get confused because they think hearing their angels guidance will be the same as hearing externally, like how you hear someone who is on the other end of a telephone. When it comes to hearing angels, you may hear a message externally, but even more common is hearing a soft and gentle inner voice that encourages you to go for it, to take an action to bring healing and growth into your experience, or to make a change. You may also simply know the angels guidance for you. It’s not that you hear it, or even receive it as a clear thought, but rather you just simply know. You may receive angelic guidance as an idea, as a download of information, or as a sense of what you’re meant to do next. Whatever the exact form, angels always deliver their messages with love, so even if you’re getting a message of warning, it will come through in a loving and empowering way and often with a positive alternative or new perspective of how you can look at your present situation. Angelic intervention can come in many forms, and when it does, you will usually sense angelic energy around the situation. A great example of angelic intervention is being in a terrible car accident and then walking away unharmed with the knowing your guardian angel stepped in to save your life. 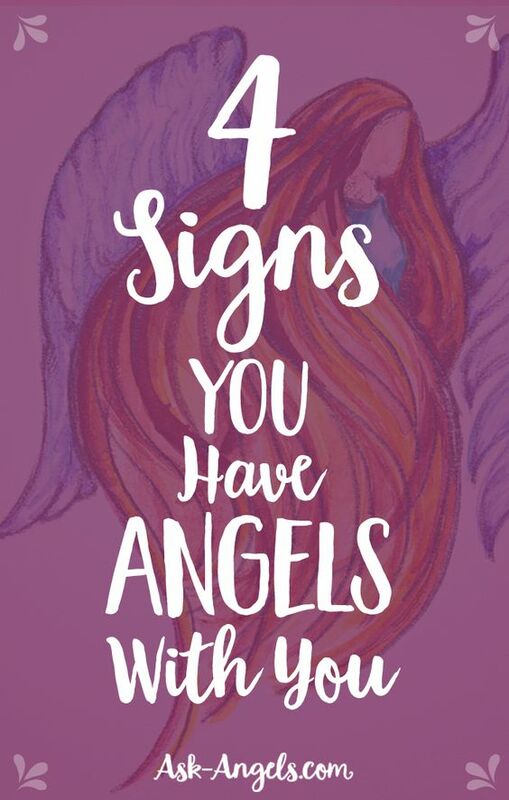 You may also know that your angels are with you when you experience synchronicity, things effortlessly lining up for you on your path, or you keep finding yourself in the right place at the right time. Another example of angelic intervention is asking for the angels to help you heal, and either find yourself feeling better with little or no effort on your part, or you find a shift in your desires and eating healthy, exercising, or changing habits comes to you easily and naturally. If you feel like your angels have positively interfered on your behalf… Trust you are in the presence of angels. I love hearing from you! Leave a comment below or on facebook and let me know! PS. Here are 12 More Signs of Angels! Angel Signs ~ 12 Signs Your Angels Are With You! 5 Ways Angels Communicate With You! About 2 to 3 years ago I started seeing the numbers 1225. In a ToysRus flyer there was a child’s clock which contained these numbers, they’ve been on my oven, in the car, and on a police car which identify the area of town, etc. It caught my attention in a big way, almost scary as I didn’t understand what was happening. I was crossing a very busy roadway near my office and on my initial ‘look’ saw no oncoming cars (I did have the green). Suddenly I hear ‘NO!’ which made me stop dead in my tracks. The driver of a small car was not paying attention and blew past me. Whew. What is very interesting is my house number is 1225. This number was with me for a very long time. Then I started seeing 521. I work in a large organization so our areas use mailcode numbers for identification/location purposes. Our mailcode number is 521. I’ve seen this number on buses. I’m up at 4:30a.m. getting ready for work and I find this is when my Angels tend to reach out, I’m usually finishing up my coffee and preparing to leave when I look at the oven clock and there it is, 521. At that time I acknowledge my Angels. Recently, the numbers 520 have been noted right before the 521. The messages that I have read associated to all 3 sets of numbers are completely understandable. The Angels are acknowledging what hardships and struggles there have been in my life and they are at work to help things be better. There was mention of a change coming, that it would ‘rock my world’. How exciting! And how reassuring to know that THE VERY BEST are at work for ‘me’. Remembering to have faith and trust is a bit of a challenge for me only because of my past many years of not expecting a whole lot however, I know that God is with me as are my Angels. Restlessness is difficult to overcome, it’s like a relentless bad itch. I have learned and appreciated my line of work for many reasons – bet the Angels were at work when I landed that job as I will benefit from that when I retire. I very much would like to retire now being my age and years of service line up but need to line up a couple of ducks first. I don’t feel comfortable at the office any longer due to a degree of toxicity and the fact that I’m losing interest anyway. I do have fear and anxiousness over the inability to leave at this moment although the Angels reinforce to me to remain positive, focus on what I want and above all, have Faith and Trust. What a lovely, warm feeling it is in knowing the Heavens are with me each and every day. I have experienced 3 of the 4 signs of angels presence and possibly all 4. The 4th one being flashing light. Every now & then the one light over our island gets brighter. The home is 5 yr old & the light is newly installed only a year. It could be a change in energy. In the same area I have 2 wall pictures and every now & then one of the pictures in the grouping of 2 will be slanted. It’s not in a walk area where people would knock it off balance. Now, maybe air flow moves it, but if that were the case, why just the one picture and why not every day? The other 3 signs happened quite a few times in my life. My angel often has intervened preventing serious accidents & got me out of dangerous situations when I was lost driving or got myself into dangerous neighborhoods. This angel is so familiar that I can request presence and in a short time the angel will be near enough that I can feel the presence. One time several years back I believe the firm command or stern order I received was my angel. I was busy packing to move & had no time to take breaks. I came across an old envelope of about 50 negatives that I had looked @ a few here & there over the years but probably didn’t view all. Before I packed them in a box for moving, a voice commanded me to sit down right now and look at every single negative. The order was so strong, I stopped what I was doing & reviewed all 50 negatives. To my utter surprise there were many pictures of a special family that I was close to. It was many pictures of this family when they were young. This was a spectacular discovery because about 10 years before I came across these negatives, the family had a fire and lost all their family pictures. Of course, I had the negatives developed & provided pictures to the family. I have experienced mild guidance-type message or planted ideas in my mind but only this one time have I experienced such a strong, powerful command to do something. I was not afraid. The presence I feel is all the time. I don’t advertise this. A couple of years ago a niece wrote a story in remembrance of a special person and although she never met this person, she recalls stories about him from aunts, uncles and her grandparents from the time she was a little girl. Today she’s 41, mom of 4 and a successful manager for one of the airlines. What surprised me was that she described her family & when she described me, she said around me from the time she was a little girl, she always sensed a spirit with me. She cannot see it but she says I don’t walk alone. I was stunned to hear this and I just accepted her story but never elaborated on it. I think the spirit she senses around me must be my angel that I feel is with me all the time. I will check out your FB page later. All my life if I really need help my guardian angels help by sending me very vivid pictures. They are not a dream because I am usually awake and they are usually to warn me about something.We have as a family always aknowledged that we must have “a flock of guardian angels ha ha”…….but we have never taken them for granted. And they seem to readily “adopt” new family members. I have always felt the presence of my angel all my life when I’m alone but never more that three weeks ago when I was involved in a car accident. A speeding car hit mine and I kid u not I felt a presence in my car guide the steering to a nearby drain. I was not injured. Everyone keeps asking how I walked away without a scratch when they see the wreck. Thing is I was having a recurring dream about cruising along the highway in the very car since I was a teen and the stars aligned for me to acquire it at an extremely low price. Two years later it’s a wreck. Have this odd feeling there is a deep meaning to this dream. Sometime l listen a sound in my ear for hardly friction of second . It’s have some meaning ? I experience sparkles of light in my peripheral vision quite often, or a flash of light (like the reflection off a car window as it passes by) only there are no cars driving by and nothing reflecting in the room, just that flash of light. I’ll get an idea popped into my head accompanied by Goosebumps on my back or leg at the same time. It’s always respectfull never bossy like an old friend that knows usually some type of guidance like let go and enjoy or quit trying to figure everything out trust.. I have had the presence of God allowing my Gurdian Angels present in noticeably in my life since I was 15. First when I tried commiting suicide at the age of 15; 2nd at the age of 19 when my 1st son was born and the doctors told me SHE was going to be born Down Syndrome, they were wrong; I had a profound dream with my child holding up a sign telling me”I’m ok Ma”! ; 3rd I was in a horrific car accident and amazingly by the grace of God; survived! I broke my neck, my C6, (C5, I would have been paralyzed from the waist down) ! Multiple physical, mental and sexual abuse. I lost my sister almost 3yrs ago this month and my father 2 years ago in November. I hear songs my sister sang and find dimes everywhere. Also, the lights in my kitchen were going on by themselves! Odd maybe? I don’t think so, I believe! I feel the presence of my mom everyday. This morning I had the most beautiful experience I saw these orbs in front of me not really knowing what they were then I realized that is my mom. At the same time I felt really warm all over and felt like I have been hugged. I feel at peace now. they are with me – no doubt!!! Hello good afternoon, where do I start ? My angels have been talking to me for maybe about a year now and the signs are amazing ! From Numbers, to feathers to feeling their presence. I have been searching the Internet for similar cases and came across your website. Thank you for the information . woow…i am so impressed that you see feathers and like you i have been searching the web for cases of feeling Angels around us..i am fascinated about the subject as i love the Holy Spirit and the company of the Angels…. I have had a recurring dream about disaster and then finding freezers full of food. I believe this is from my Angels that things are going to be fine. Hopefully soon as we have had financial problems for the last 12 months. ?? I can feel these angel signs…synchronicities..repeated number sequences…hearing guidance in my mind. I would love to read more on Archangels and ascended masters. Greetings everyone! I wanted to let you know what just happened to me: while I was reading this post, a box on a shelf near me fell off. I know for sure that this didn’t happen by chance, I know the angels gave me a sign! Thank you. Much love. I have been able to see angels as colored orbs in my mind’s eye when I close my eyes for at least 10 years by now (mostly green and purple). I didn’t think much of it before. But this summer I had what I would call a near-death experience from pneumonia and I started being able to hear angels and talk to them. I have no doubt that I am still here because of their help. i felt my angel, whom beleive is my dad, lie behind me in a spoon- like position in my hospital bed, while I was recovering from a hysterectomy. My pain went away immediately as I felt him caresse me. Occasionally, the breeze will carry his sent and this is how I know my dad is with me. My youngest son, was nearly killed at work mi still wonder how his boot lace could have sustained him mid-air at his weight of more than 400 lbs ( aT the time.. I’m so proud to say that he has lost 2111 Ibs now) thus, not falling into a large engine below. Although the he suffered the dislocation of his ankle requiring surgeries to correct it beleive that his angel interveined thus, saving my son from a tragic / fatal accident. I wonder who my Angel is? I sometimes also notice a “warmth” that comes over me. It isn’t body heat or heat from the environment. It is like a warm safe blanket wrapped around me. Sometimes it gets pretty intense when I’m really surrounded or there is a lot going on. Most likely that is what you meant in one of the points you made, but when I feel this “warmth”, I know that I’m really wrapped in the arms of love. When my son Joshua was 3 years old, I witnessed Devine intervention. My son was saved by a Angel. He ran into the street and in front of a police car. I watch my son being lifted up by his overalls before the officer could react and placed out of harms way. The officer stunned by what he had just witnessed got out of his patrol car and got down on he knees in front of my son. He patted my son down with this look of shock. No words can describe what my heart was feeling at that moment. But the experience changed my life forever. THANK YOU MY LOVELY ANGELS FOR ALWAYS BE WITH ME EVERY TIME, I LOVE YOU SO MUCH FOR ALL THE SIGNS YOU;RE SHOWING ME THANKS YOU I;LL CONTINUE LOVING YOU WITH ALL MY LOVELY HEART AMEN . It's true, surrounded by my angels. Sometimes even i think i'm a bit crazy! Hi I would just like to ask can amgels appear in human form ?,why I ask is some years ago my daughter who was then in her twentys fainted while out shopping with me her mother,she banged her head and was out cold all of a sudden from know where a young man appeared ,he started to help my daughter as know one else seem to know what to do,he brought my daughter round and all so calm me down as I was worried for my daughter as she said she couldn’t see,after the ambulance men came to the shopping centre he explained her symptons and then like he came he was gone ,the ambulance man asked me who was that he seemed to know a lot and was right,i said I don’t know he just turned up,after my daughter was treated in hospital that day we were just leaving he turned up again like he knew were we were asked my daughter how she was by her name which we didn’t mention at the time of her fainting,he asked how I was and before he was about to leave we both thanked him for his help ,he smiled at the both of us and walked away out of the door I ran to look where he was going just 2sconds behind him.i could not believe he had vanish nowhere to be seen,my daughter turned to me and said mum that was my angel ,????? Everything you’ve said is correct, but when I read or hear a certain thing, I get goosebumps!Like my body picks up on their presence.. Am I rigt ? Is that a sign, I think it is.. Would love your feed back because I got goosebumps reading your article. On New Year’s Day this year a yellow circle moved slowly around the bedroom ceiling it lasted for about 5 minute and then disappeared after a sparkle I would love to know what it mean. Thank You. I mean to ask this question with the utmost of respect but it’s something that is weighing on my mind. I’m reading this page as though it is meant to teach. My question is, how do you or any of us for that matter, know that this is fact? Where does this info come from? I have experienced what I would refer to as a possible angel intervention but cannot know for sure. I guess what I’m looking for is proof that this information is correct… Thank you for understanding my confusion. I’m recently becoming aware of their presence through different sensations. My favorite is by what sounds like a beautiful soft fine mist, above or around me. The more it’s increased in volume, the more excited they are or powerful the moment is.